I’m noticing lately how much I apologize. I apologize in texts, in emails, in person. I was just lying in the bath (one of my most favorite and most effective ways to unwind) and I was apologizing in my head as I crafted an email response to someone I haven’t been very good at reaching out to this year…and who has been quite good at reaching out to me (hi Mike!). On top of the apologizing, I then feel the need to explain WHY I haven’t kept all the balls in the air (but really, who usually does have all the balls in the air for more than a hot minute?). I can’t seem to give a simple “no” in response to requests that are made of me. I must regale the one who asked with all the details of my very full, sometimes overbooked life. Because I couldn’t possibly just take a weekend or a day for myself, right? I must prove that my inability to meet the needs of the requester is only because I will be meeting someone else’s needs at that very same juncture in time (not my own of course, never my own!). I’m exaggerating a bit as I write this because I do take some time to myself, and I definitely take more time than many women I know who have chosen to raise small humans (and perhaps also those of my friends who have not chosen to raise small humans–most of my experience and conversation in this area has been with other moms). But it often feels like it’s not enough time for myself. And when I do take that time for myself, to focus on the things that I’m interested in, the things that bring me to a higher level of peace, or health, or personal fulfillment…something else “suffers” or a ball gets dropped. My laundry piles up. The kid that’s still at home with me 3 days/week watches too much TV while I get a handle on life or housework or sneak away to watch Call the Midwife. My business suffers. My husband feels ignored. I don’t reach out to friends, and then I feel guilty when they reach out to me first. I give a lot of coaching and support to other people, and something that I see often is people feeling badly about themselves if they are in a “down” cycle. We tend to beat ourselves up the minute we aren’t motivated to take on the world (or the seasonal purging of the kids’ closets); we doubt ourselves when the fire under us dampens a little bit. We say something’s “wrong” and we look for how to “fix” it. What I like to remind people of is that life is cyclical. The laws of physics state that what goes up must come down. Why do we humans keep forgetting this? Why am I forgetting it now myself? If I look at my life in terms of intake vs. output, I have certainly put out A LOT of energy to A LOT of people. It’s something I love to do, and I will continue to do it. However, I’ve also recognized that this year is about ME in a lot of ways. This is the year I focus on my passions. This is the year I take care of myself. This is my Year of Radical Wellness, dammit, and yet I find myself sitting here, unable to enjoy my lovely bath because I’m too busy begrudging myself a little time for intake in the whirlwind that is my life. I kind of want to apologize to you, dear reader, that this post isn’t longer. It doesn’t have a fancy ending. I’m not even staying up past midnight to write it (gasp! no self-sacrifice here!). But I won’t bore you with that oh-so-predictable habit. I wish you a lovely Memorial Day weekend, and may you take many guilt-free moments to yourself! 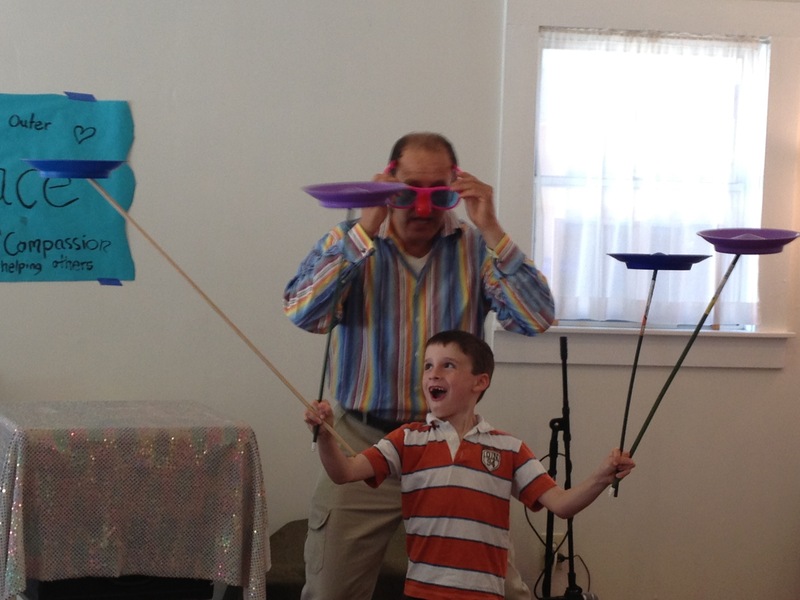 Dylan (in June 2013) had ALL the plates in the air for a hot minute! This entry was posted in Reflections, Sufficiency, Wellness, Year of Radical Wellness and tagged apologies, balance, being enough, Radical Wellness, self-care. Bookmark the permalink.